Summer is always perfect for brights - bright nail polish, bright clothes, and bright makeup (not necessarily all at once, of course - but then again, why not?). For girls who aren't comfortable with bright nail polish or bright clothes, bright makeup is a good way to start off bringing some summer into your look. It's always good to pick one feature (lips, eyes, cheeks) and put a pop of colour onto it, like a bright lipstick in an otherwise-neutral face. But my favourite by far is to wear entirely neutral makeup, but with bright eyeliner. That way, your look isn't drastically changed (after all it's only a line or two of colour), but you get in on the brights trend. Today's trend-related swatches are the Collection 2000 Glam Metallics Coloured Eyeliners. That's a long name, LOL! Collection 2000 is the Wet n' Wild of the UK - the cheapest drugstore brand for makeup you'll possibly find. The last time I talked about this brand, I swatched some of their eyeshadow palettes HERE, but I didn't think they were all that special. However, this time unlike the eyeshadows, the Metallic eyeliners aren't too shabby. Here's a peek. Don't they look nice and metallic? Vinyl 1 is a pretty metallic silver, that really looks like metal. Fierce 2 is a metallic gold, and this one also does look really gold. Ripped 3 is a lilac purple, very pretty and a nice feminine twist on metallic eyeliner. Groupie 4 is really cool. It's a turquoise aqua colour, and I think this one does have a slight gold sheen to it. It's not a duochrome, but just a slight sheen. It makes it a little more unique. Punk 5 is a sky blue that's pretty bright. Grunge 6 is a light yellow green, that reminds me of grass. 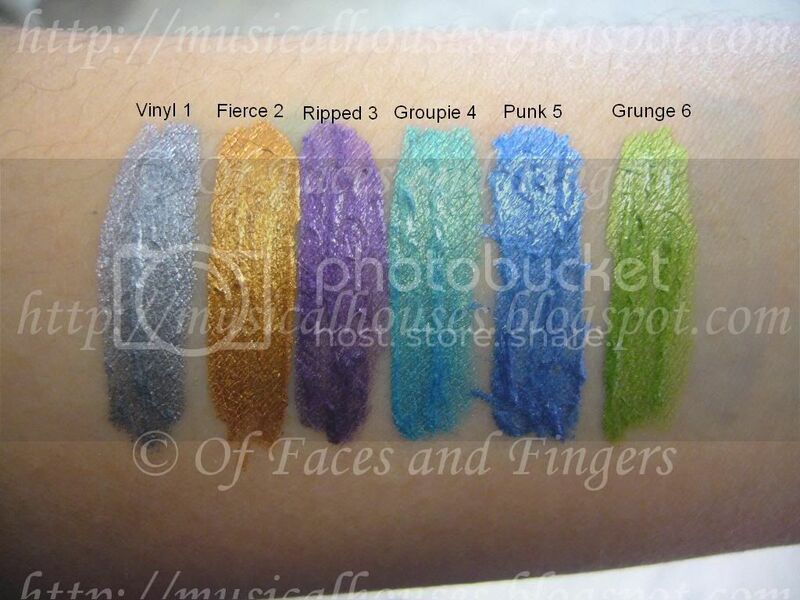 I noticed that when I swatch these they were decently pigmented. Not massive pigmentation, mind you, but decent, especially given the price. And another thing that I thought was good, was that after I had swatched them, I tried to wipe them off, and I found that a couple of the colours left a stain behind on my skin. I'm just going to take that to mean that these things have decent staying power, hopefully. It's hard to tell when you're just swatching them. But in terms of colour and pigmentation, these are not bad at all. How pretty!! I keep seeing this brand pop up (for their liners), and I would love to try them. These are so bright and intense, I love them, they seem good value. These are such gorgeous colors!